St. Demetrios parishioners participate in the “Spirit of Lent” concert at St. Nicholas Greek Orthodox Church in Wyckopf, New Jersey, as members of the Eastern Federation of Greek Orthodox Church Musicians. This entry was posted in News on April 2, 2018 by stdemetrios. Commemorative photo with students and community members. In the lower row to the left are distinguished, Spyros Kalambakas, Judge Marina Corodemus (parish council president), Wilda Diaz (mayor of Perth Amboy), Dimitrios Kakadelis, Alexandra Velmahou (Greek teacher), Konstantinos Kakadelis. Photo: Ag. Dimitriou. PERTH AMBOY. On Sunday, March 25th, the community and Greek School of St. Demetrios, honored Greek Independence Day in Perth Amboy, New Jersey. The pupils performed poems, sang and danced, offering joy, emotion and pride to the packed event hall. Judge Marina Corodemus, parish council president, congratulated students who, as she stressed, continue to celebrate the brilliant tradition and history of the homeland. The Greek teacher, Alexandra Velmahou, wished many years to the Greeks abroad for the double celebration of Hellenism and Orthodoxy and good progress in all Greek schools. Perth Aboy mayor, Wilda Diaz, attended the event and praised the work and contribution of Hellenism. “We feel very proud,” she said, “for our fellow citizens, the Greeks who live and work in our city. What they have offered for more than a century is invaluable. This entry was posted in News on March 27, 2018 by stdemetrios. ΠΕΡΘ ΑΜΠΟΪ. Την επέτειο της Ανεξαρτησίας τίμησε την Κυριακή 25 Μαρτίου το Ελληνικό Σχολείο της κοινότητας του Αγ. Δημητρίου στο Περθ Αμπόι Νέας Ιερσέης. Οι μαθητές απήγγειλαν ποιήματα, τραγούδησαν και χόρεψαν προσφέροντας χαρά, συγκίνηση και υπερηφάνεια στην κατάμεστη αίθουσα εκδηλώσεων. Η δικαστής Μαρίνα Κοροδήμου, πρόεδρος του εκκλησιαστικού συμβουλίου, συνεχάρη τους μαθητές οι οποίοι, όπως τόνισε, συνεχίζουν επάξια την λαμπρή παράδοση και ιστορία της πατρίδας. Η δασκάλα των Ελληνικών, Αλεξάνδρα Βελμάχου, ευχήθηκε χρόνια πολλά στην Ομογένεια για την διπλή γιορτή του Ελληνισμού και της Ορθοδοξίας και καλή πρόοδο σε όλα τα Ελληνικά σχολεία. Η δήμαρχος του Περθ Αμπόι, Wilda Diaz, που παρακολούθησε την εκδήλωση εξήρε το έργο και την προσφορά του Ελληνισμού. “Νιώθουμε πολύ υπερήφανοι” τόνισε, “για τους συμπολίτες μας τους Ελληνες που ζουν και εργάζονται στην πόλη μας. Η προσφορά τους για πάνω από έναν αιώνα είναι ανεκτίμητη. This entry was posted in News on August 11, 2017 by stdemetrios. St. Demetrios GOYA are enjoying a fun-filled week of activities including a visit to Bradley Beach and Knockerball! They will be celebrating summer with a movie, a pool party and bbq as well as a Met’s Game. A big thank you to Nick and Cindy Giannokopoulos and Demetra Wagner for organizing and chaperoning all events. This entry was posted in News on July 11, 2017 by stdemetrios. A big thank you to Helen Horan, Kally Durso and Maria Montoudakis for a successful Vacation Church School at St. Demetrios! Vacation Church School Is Underway! From Monday, June 26 until Friday, June 30, our children are enjoying our Summer Vacation Church School! The theme is “Behold The Light” celebrating and teaching the feasts of the life of Jesus. Helen Horan, Maria Mantoudakis and Kally Durso are making it a memorable experience with fantastic lessons and fun crafts! This entry was posted in News on June 28, 2017 by stdemetrios. 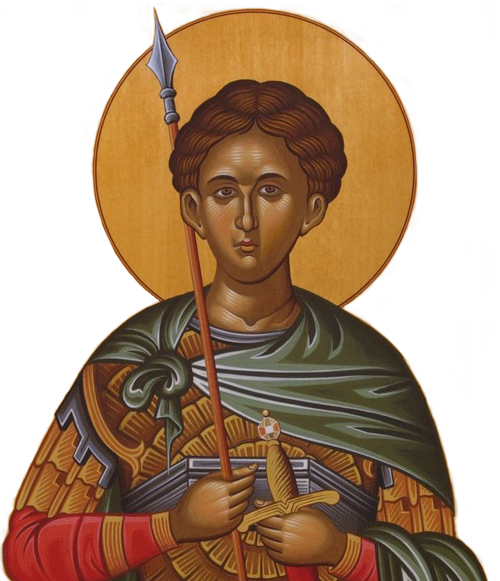 The iconography project for St. Demetrios is underway! The scaffolding is up and the iconographers are beginning their work. This entry was posted in News on June 23, 2017 by stdemetrios.